Introducing our new for 2019 series. The new series, CMO 1x1, looks at the biggest challenges facing CMOs and senior marketing managers this year. Expect industry experts from some of the biggest brand names to cover the topics that matter most to you. This month, we feature Talkwalker’s very own Elena Melnikova discussing the best marketing tools, in the marketing tech stack. 2018 was a turning point for the marketing tech stack. 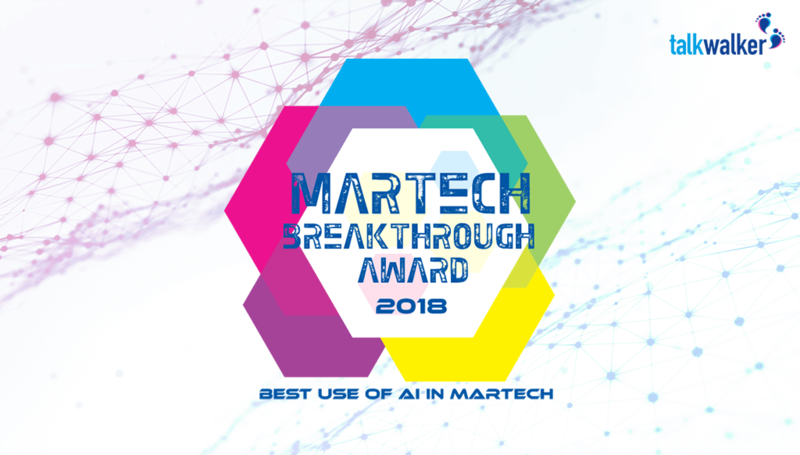 For the first time, MarTech now takes the highest percentage of marketing spend with 29%, according to Gartner’s 2018-2019 CMO spend survey. Compare this with 22% spent on labor. To kick off our brand new CMO 1x1 series (it’s going to be amazing), we’ve interviewed our very own CMO, Elena Melnikova, on how Talkwalker defines and chooses its marketing tech stack. Q1. 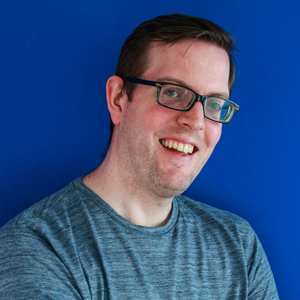 So, you’re Talkwalker CMO. How did that come about, and what does the role involve? Elena: 4 years back while on my honeymoon trip around the world I got a call from Robert, our CEO, who offered me the role of Head of Marketing within a growing social listening startup. Coming from a big international firm like Deloitte, moving to Talkwalker was clearly a gamble. The company was only 35 people back then, and my team was 3. Looking back now I definitely made the right choice - Talkwalker expanded globally to more than 200 people today. My team went from 3 to more than 15 marketing superstars of 13 different nationalities. I think my ability to plan & organize things definitely helped throughout the growth phase of Talkwalker, and the expansion of the marketing team. Also, I trust my team members and their expertise, and leave them enough autonomy to test new things, make their trials & errors. That's something which motivates and encourages them to make an impact. The biggest challenge we face at present is keeping the team united. I have to manage cultural differences & different ways of working, ensuring all team members manage their own priorities while still working towards the same goal. We have a great team spirit. And coming to work should be fun. But there are high expectations too, with key KPIs to achieve and constant change. But by working as a team, with aligned communications, effective time management, and clear goals, we always get the job done. That’s where our tech stack comes in. No matter what tool we use, it’s all about making us more efficient. Taking the right information, understanding it, and sharing it across the team and company. That way, we make data-driven decisions that everyone is a part of. Talkwalker: Elena’s so right about aligned communication. Most beneficial for the team at Talkwalker, is the Talkwalker Command Center. We use it to regularly monitor our social media marketing efforts in real time. We’re predominantly lead generation focused, so it’s great to be able to see exactly what conversations our content is generating, so we can instantly shape those conversations into conversions. A Talkwalker Command Center in action (NB. Not our office). Q2. What is a tech stack, and what’s in yours? Elena: A marketing professional is a different beast today than it was a couple of years ago. You have to be an agile technologist & data scientist. With marketing departments today using more tools than IT! The marketing tech stack is a set of all these tools marketing professionals are using within companies to drive operational efficiencies and marketing ROI. The better the tech stack, the more effective your team. The trick is to ensure you have the right tools to suit your needs, without spending a fortune. As a technology company, we use a lot of tools to help us with our marketing day-to-day - around 30 across the whole team. Our stack can be summed up in 3 words. Collaboration, communication, and analytics. To keep the team united, and data-driven. 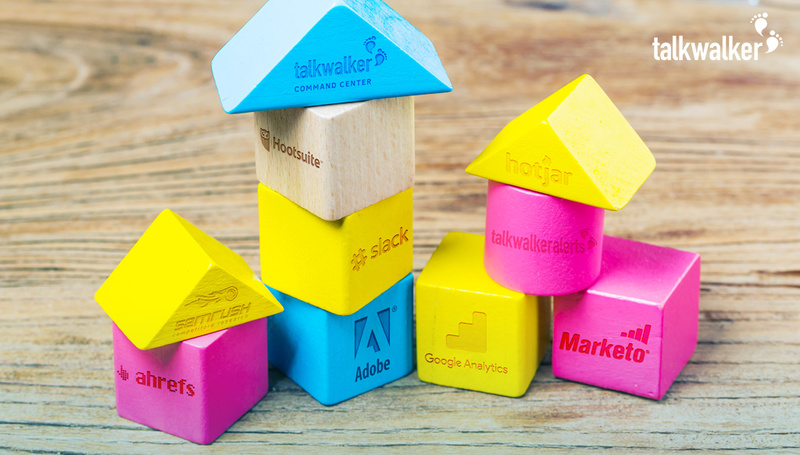 For analytics, we look at Google Analytics, Salesforce, and of course, Talkwalker. Marketers can no longer afford to make decisions on instinct. We rely on effective data to ensure ours are designed to drive real impact. For collaboration, Google Hangouts, G Suite, Slack, Talkwalker Command Center, and Go2Meeting help us keep our team connected, even when in different time zones. And for communications, we engage our clients and prospects through Marketo, Hootsuite, and a full suite of social media tools. And we can’t forget the Talkwalker tools themselves. Our team use them daily to create new content and monitor our brand effectively. It’s important for us to use our own software, just like our clients, so we can help develop them as industry-leading platforms. The tech stack hasn’t changed much over the last few years. It’s rare for us to drop a tool once we adopt it. We’re very good at researching the right tools for our needs and always look to the future as well as today. We expect our tools to scale with the business, so we don’t have to change provider every few years. We always look for that spark of difference. Innovation is part of Talkwalker, and we want tools that have that same originality. You can’t expect to grow unless you stand out, and you need innovative tools to do that. Talkwalker: Quick Search is certainly our favorite tool. It’s a key part of our content marketing strategy, as it helps us source ideas for new types of content, whether that’s blog posts, scheduled posts on our social channels, or ideas for reports. It’s a great tool and it’s the fastest way to brand and communication insights. With Quick Search, you can quickly search for the keywords, to help you create content that engages with your audience. Q3. 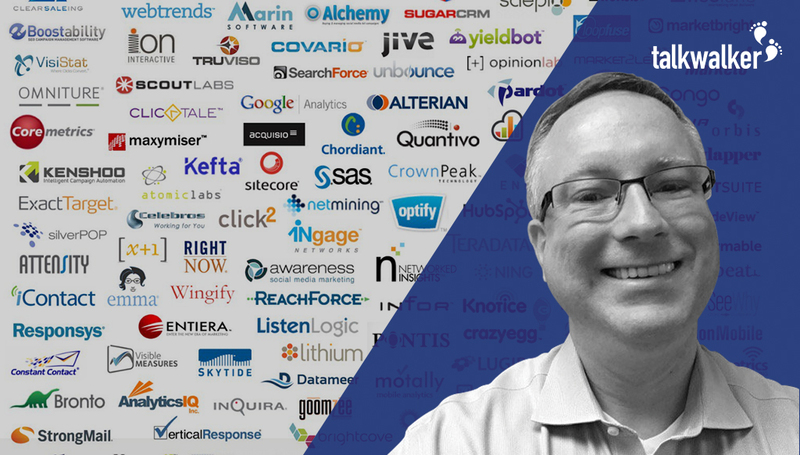 What advice would you give to other CMOs to help them define their tech stack and marketing tools? Elena: Start by thinking which tools your teams need & how a tool will solve that problem. It may sound obvious, but each tool should fulfill a role. You need to know exactly what that role will be. Then, decide how you’re going to monitor that tool’s performance. Define the KPIs to measure it. Operational aspects are important to consider. Will it take weeks to onboard your team, or just hours? And will the time saved offset the extra time used for implementation, learning and maintenance? Is there support to help you manage that time expenditure? At Talkwalker, we always look for innovation and scalability. We try to use the tools that will stand out and grow with us. There’s no point in switching platforms every couple of years. Then there are the other aspects to consider. Integration with other tools will be essential in the future. And any that add additional reporting or analytic features would be beneficial too for following your KPIs. The cost is obviously important. We don’t have endless budgets, so you have to keep the investment in mind, and see how it stacks up against the benefits. There has to be real ROI there. Finally, once we add a new tool, we ensure the team is fully trained in using it. And that they make the most of it in their roles. You don’t just want a Formula 1 MarTech stack, but top-notch drivers too. Talkwalker: When it comes to scalability, Marketo is the tool that comes to mind. It’s now essential for our email marketing campaigns. When it first came to choosing the tool, we considered several options, but Marketo had that spark that made it stand out, and it certainly scaled for the business. Marketo helps us build relationships with customers. Q4. How do you map your marketing tech stack against your business needs? Elena: We split our tech stack into 5 segments - collaborate, attract, nurture, convert and engage. This structure helps us understand exactly what role each tool should fulfill. If you don’t understand why you’re using software, you shouldn’t be using it. Collaborate stands alone as our way to keep the team connected. This is where we include our main communication tools. The other sections are plotted against the customer journey. Attract is about driving awareness of Talkwalker. Nurture helps us convert that awareness into leads. Convert is about taking those leads and making them clients. And engage is about turning those clients into advocates, and nurturing the next stream of leads. Although some tools cross between roles, this structure works well for us. It means, we can easily see what tools make an impact, and which don’t. We’re very data driven, so we back up all our decisions with data, not emotion. That means when we adopt a tool, we monitor our results effectively, and ensure we get a valuable ROI from it. Talkwalker: Conversion rates are important, and we use Google Analytics to monitor our website visitors in depth, to really understand their customer journey. Whether they convert from a social media post, Talkwalker Alerts (one of our free tools), a blog “call to action”, or whatever, we know exactly what attracts and nurtures our clients. Google Analytics is essential for seeing exactly what content is driving leads. Q5. How will marketing tech stacks change in the future? Elena: I think the biggest change we will see is more integration. We’re in a Catch-22 situation, where marketers need more tools to handle more tasks, but they can only handle so many tools at once. Tech stacks can only get so big before they’re unusable, so marketers will want fewer platforms to solve their business needs. Therefore, expect more integration. Your favorite tools collaborating to provide you with the same information or functionality, but from one location. You can look at Hootsuite and Talkwalker as an example. You can access your social insights from Talkwalker analytics from within Hootsuite, and then respond instantly across your social media channels. By losing that step between platforms, your team becomes more time effective, which is win-win. Also, expect to see more AI aspects in your tool. Over the last couple of years, we’ve seen AI become more democratized, allowing more people to benefit from artificial intelligence and automation in their roles. With AI appearing in the most day to day tasks, like automated responses in Gmail, expect more ingenuity and acceptance of the technology in the future. Talkwalker: It would be a lost opportunity, if we don’t mention the Talkwalker AI Engine here. It’s a powerful boost to social analytics, and makes it easier to handle and analyze big data sets. We’ve set up queries in a matter of minutes, that would have taken hours in the past. And we can certainly see us integrating more artificial intelligence applications in the future. Image recognition is just one part of the Talkwalker AI Engine. Stay tuned for the next CMO 1x1 coming soon! This is just the beginning of the CMO 1x1 series. We have an amazing lineup of CMOs to discuss the issues, topics, and trends that matter most in marketing in 2019. To discover more about Talkwalker’s marketing tech stack, and how to build your own, our free report can be downloaded below.